In March of 2018 cybersecurity nonprofit abuse.ch launched a new project called URLhaus. Its goal: to search and destroy compromised web pages that were being used to distribute malware. Fast forward to today and URLhaus has helped cleanse the Web of more than 100,000 malicious pages. URLhaus is a collaborative effort and some 265 cybersecurity researchershave contributed to the project so far. Abuse.ch reports having received more than 300 malicious page submissions every day. That number jumped dramatically this month. On January 16 reports more than doubled to 701. Yesterday URLhaus broke the 1,000 submission mark for the first time. Expect those numbers to continue climbing as more members of the cybersec community get involved. Two strains of malware make up a substantial percentage of the submissions so far. Heodo, a botnet that is commonly used to launch DDoS attacks and distribute additional malware, leads the way with more than 16,000pages blacklisted. In second place is Gozi, a widely-distributed spyware tool that has the ability to record keystrokes and steal login details from web browsers. Abuse.ch shared some additional statistics about its work so far. Some of the most interesting dealt with the responsiveness of hosting providers around the globe. Providers in the United States typically took swift action after receiving a notification from URLhaus. Digital Ocean, which saw the most submissions of any provider, averaged about 6 days. Household names GoDaddy and Google were slightly slower at 9 and 8 days, respectively. Faster is better, naturally. The sooner a malware distribution point is removed from the Web the safer things are for everyone who uses it. Unfortunately not all content distribution networks respond as quickly. Some providers allowed reported URLs to continue pushing malware for weeks. In one case nearly two months passed between the URLhaus alert and the link’s removal. The longer these malicious pages remain online, the greater the harm the malware can do. Hopefully providers will start working more closely with URLhaus and bringing their response times down. Swift action on their part means a safer Internet for everyone. A 34-year-old man from Somerville, Massachusetts, has been sentenced to 10 years in prison for launching distributed denial-of-service (DDoS) attacks against two healthcare organizations in the United States. Martin Gottesfeld, who identified himself as a member of the Anonymous movement, was accused of launching DDoS attacks against the Boston Children’s Hospital and the Wayside Youth and Family Support Network back in 2014. The attacks on these organizations were part of a campaign related to Justina Pelletier, a teen who had been the subject of a high-profile custody battle between her parents and the state of Massachusetts. Boston Children’s Hospital and Pelletier’s parents entered a dispute over a diagnosis and a judge awarded custody of the teen to the state. Pelletier was later moved to Wayside Youth and Family Support Network, a residential treatment facility. Gottesfeld posted a video on YouTube in the name of Anonymous urging others to launch DDoS attacks on the Boston Children’s Hospital until Pelletier was released. According to authorities, the DDoS attack aimed at the hospital was powered by tens of thousands of bots. The attack caused disruptions not only to the Boston Children’s Hospital, but also several other medical facilities in the Longwood Medical Area. The Boston hospital claimed that the attack had cost it over $300,000 and led to the organization losing roughly $300,000 in donations due to the attack disabling its fundraising portal. Gottesfeld became a suspect a few months after the attacks were launched. His home was searched and his devices were seized, but he was not charged at the time. In February 2016, he and his wife attempted to flee the country on a small boat, but they returned to the US on a Disney Cruise Ship that had rescued them off the coast of Cuba. Gottesfeld was arrested upon his return. He was convicted by a jury on August 1, 2018, of one count of conspiracy to damage protected computers and one count of damaging protected computers. He has now been sentenced to 121 months in prison and ordered to pay nearly $443,000 in restitution. According to Reuters, Gottesfeld plans on appealing the sentence, but says he has no regrets. What just happened? At least three men and over a dozen websites got an early Christmas present from the FBI. 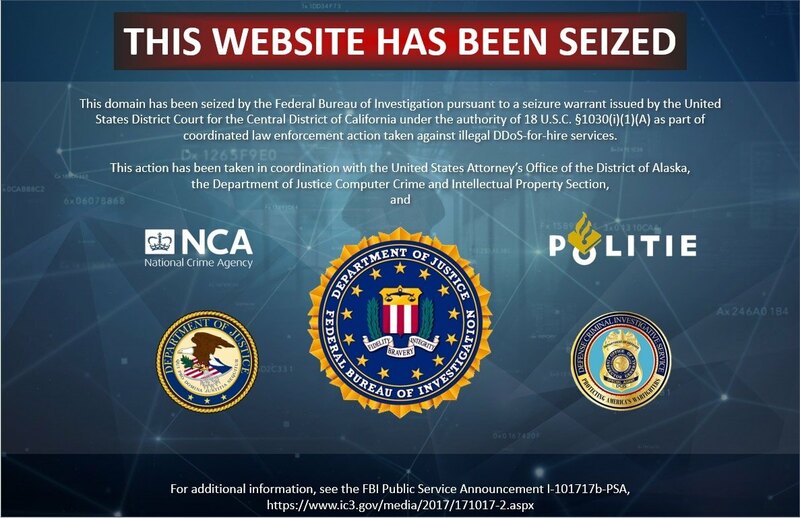 In cooperation with California and Alaska authorities the US Federal Bureau of Investigation seized several website offering DDoS services and arrested three individuals running some of the sites. On Thursday, federal authorities seized 15 different “booter” websites and charged three individuals with crimes. Booter sites, also known as “stresser” services allow individuals without any hacking experience to execute distributed-denial-of-service (DDoS) attacks for a fee. These sites have mostly flown under the FBI’s radar because they advertise themselves as services to be used for stress testing domains that are owned by the subscriber. However, they have long been used to interrupt other websites, usually out of anger or spite. Many of the seized domains have been identified as being behind recent DDoS attacks of serval gaming websites. “The action against the DDoS services comes the week before the Christmas holiday, a period historically plagued by prolific DDoS attacks in the gaming world,” said an FBI press release. In addition to the seizure warrants executed against the websites, two men have been charged with conspiracy to violate the Computer Fraud and Abuse Act. Matthew Gatrel and Juan Martinez have both been indicted with crimes relating to their operation of websites Downthem and Ampnode respectively. A third individual, David Bukowski has been charged with aiding and abetting computer intrusions. Bukowski allegedly operated Quantum Stresser, which was one of the longest running of the DDoS services on the web. The FBI estimates that the site was behind over 50,000 successful and attempted attacks in 2018 and had over 80,000 subscribers since 2012. While no users of these services have been arrested, authorities caution that they can and will seek prosecution of anyone paying for cyber attacks. Servers for Square Enix Co.’s popular online game “Final Fantasy XIV” has been hit by a series of cyberattacks since early October, preventing some users from accessing the service, its publisher said Thursday. The distributed denial of service (DDoS) attacks, in which multiple hacked computers are used to flood the target system, were carried out to an “unprecedented extent” against data centers in Japan, North America and Europe, Square Enix said. The identities of the attackers are not yet known, although information security experts suspect links to cheap online services that carry out so-called DDoS attacks. Two major attacks in early October and late October prevented game players from logging in to the service or cut off their connections for up to 20 hours, according to the company. Square Enix has taken steps against the attacks but the servers were attacked again Tuesday night, disrupting the service for some 50 minutes. “FFXIV” had previously been subjected to DDoS attacks. A study by a U.S. internet company has showed that some 80 percent of DDoS attacks worldwide are targeted at game services. “The attacks may have been carried out by people who commit the offense for pleasure, hold a grudge against the company or seek money,” said Nobuhiro Tsuji, an information security expert. “The attacks have extended over a long period, and, while it is costly, there is no choice but to boost countermeasures,” the expert at SoftBank Technology Corp. said. In 2014, a high school student in Kumamoto Prefecture was found to have used an online DDoS attack service to disrupt a different game company’s operations after he became frustrated with the way the game services were managed. He was referred to prosecutors the same year.